Painter and printmaker Herschel Levit was born in Pennsylvania in 1912. He studied at the Pennsylvania Academy of the Fine Arts, and was a member of the Philadelphia Art Alliance, Philadelphia Print Club, and the Modern Etchers Group. Library of Congress, 1946; Brooklyn Museum; and the Metropolitan Museum of Art. His work is represented in the collections of the Free Library, Department of Education, Philadelphia; the University of Pennsylvania Museum; and the Mexican Navy Department, Mexico City. 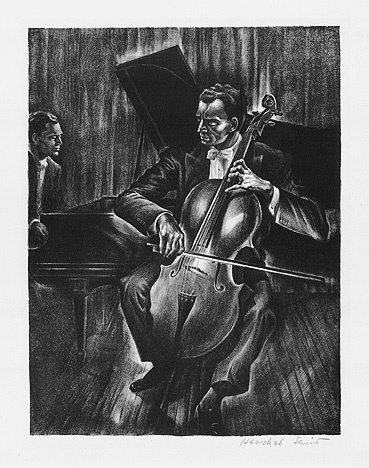 Employed by the WPA, his commissions included murals at the Rowan School, Philadelphia; Recorder of Deeds Building, Washington, DC; USPO Buildings, Leisville, OH and Jenkintown, PA.
Levit taught at Pratt Institute for more than 30 years and created illustrations and advertising for a wide range of clients. Image size 12 x 9 1/16 inches (305 x 230 mm); sheet size 15 1/2 x 12 1/2 inches (394 x 318 mm). A fine, rich impression, on off-white wove paper, with full margins (1 1/2 x 1 7/8 inches), in excellent condition.